Although insect problems are more common on outdoor plants, they can occur on indoor plants as well. Insects can be brought in by pets, come in through open doors and windows, or travel with patio plants that are overwintered inside. Infestations can also come from newly-purchased stock, which should be inspected carefully before being brought into the house. For small infestations, or those that are just starting, wiping down the leaves can remove the insects and stop the problem. Mix together one-half teaspoon of dish washing liquid in a quart of warm water. Dampen a soft rag in the soap mixture and wipe down all the leaves of the plant. This will remove insects as well as the dust in which they thrive. Dish-washing soap also kills some types of pests, such as aphids and repels others. When wiping, be sure to wipe both the tops and undersides of the leaves. Many unwanted pests live on the undersides of leaves. For mild problems with pests, where only a few leaves are infected, simply prune away those leaves by cutting them with sharp scissors or pruning shears. 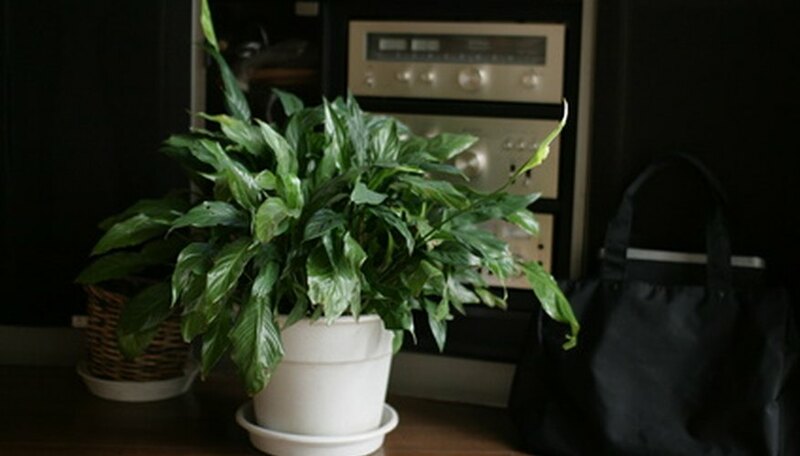 Remove the leaves from the house, and place them in the trash or in a plastic bag to keep the insects from spreading to other indoor plants or to outdoor plants. Also, rinse the scissors or shears with a mild bleach solution before using on other plants. For severe infestations, try pruning the plant all the way back, leaving only a few leaves or a section of stem. This should be a last resort measure, in place of discarding the entire plant. Check before cutting the plant back to see if it is a type that will regenerate. With larger insects or very small infestations, remove them by hand. Carefully pluck pests such as caterpillars or cutworms off of leaves, taking care not to further damage the plant. Use a nail file to gently scrape other insects off such as mealybugs. Smaller plants, or those filled with many tiny leaves can be treated by dunking them in warm, soapy water. Fill the sink with lukewarm water, and add a teaspoon of dish washing liquid. Cover the plant's soil with foil or plastic wrap, securing it tightly so that the soil will remain in place when the plant is turned over. Carefully dunk the plant into the water, submerging all the leaves and as much of the stem as possible. Turn it back over and allow it to dry before removing the foil or film from the soil. Don't let the soil become soaked with the soapy water.